The Costa Blanca has cemented its position as a leading golf destination by being voted the International Association of Golf Tour Operators' (IAGTO) European Golf Destination of the Year. One of the most prestigious accolades in the world of golf travel, the award recognises the exceptional quality of Costa Blanca's golf facilities and service. Mr Francesc Colomer, the Minister of Tourism for the Region of Valencia, said: “The Costa Blanca has become a major golf destination thanks to its outstanding flight connections, climate, complimentary offering and quality courses. 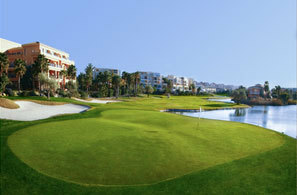 Our courses were designed by the most prestigious names in the golf world, including Ballesteros, Nicklaus and Olazábal. IAGTO's 670 golf tour operators from 64 different countries cast their votes for these awards. Each operator was asked to nominate what they considered to be the best performing golf destinations this year as enjoyed by their golf travelling clients. The Costa Blanca will host a PGA Senior 2018. This PGA tournament attracts the best golfers over 50 along with thousands of their followers and will take place in the Melia Villaitana golf course in Benidorm, although the date is still to be set. Visit iagto.com for more information.